You should probably check out Phantasm (1979) and Phantasm II (1988) as it helps to explain the characters a bit more. Not the plot, really, as it's completely insane. Just know that the Tall Man (the wonderfully creepy Angus Scrimm) and his army of minute minions have been trying to capture a guy named Mike ever since he was a kid, but Mike's brothers friend Reggie ain't going to let that crap happen without a fight. Accompanied by a floating sphere that contains the consciousness of Mike's deceased (kind-of) brother Jody, Reggie travels to an abandoned town that serves as some sort of base of operations for the Tall Man. There he meets Tim, an orphaned kid who puts Kevin McAllister to shame, and Rocky, a sassy military veteran who is pretty handy with a set of nunchucks. Together they fight the tall man. 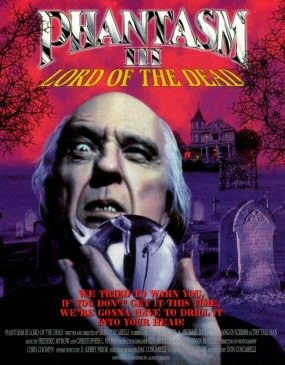 While the first Phantasm is generally scary at times, by the third installment much of the creep factor is gone. Sure, there's still a moment of dread to be found here or there, but this movie would much rather relish in being exceptionally gory, over the top awesome, and just strange. There's a plot here, but it's kind of incomprehensible. I'm not saying that's a bad thing, I'm just saying that's the way things are. While the original Phantasm feels like a really bizarre dream you've experienced that's ripe for interpretation, Phantasm III feels like what happens when you dump a bunch of disparate action figures out onto the floor and just start playing. It knows it's absurd and just relishes that. Quadruple shotguns and armies of zombies cover over a great many film snafus in my book. While there might be some cheese factor here (OK, at times it's a veritable Ro-Tel dip of a film) overall the movie is just so darn likable. Whether it's characters that you'll enjoy (Reggie Bannister is such an unlikely seeming hero that you can't help but root for him and Gloria Lynne Henry's Rocky is pure 1990's awesomeness) or the weird stuff you'll see (the infamous killer spheres really get some great screen time in this film), if you approach this movie with a good mindset, you'll love it. It's splatstick; be ready for lots of blood and embalming fluid to cover the walls. Just don't be prepared to know what the heck is going on, because that's not Phantasm's bag, baby. Just curious, we're getting lots of people checking out this review. Where are you all coming from? Is there some massive online Phantasm fan community that I'm unaware of?